For those still sticking to the popular screenshot tool, Shutter is available to install in Ubuntu 19.04 via a third-party PPA. 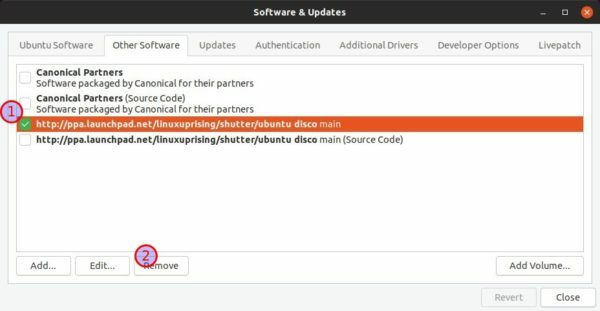 Shutter is no longer available in Ubuntu Software since Ubuntu 18.10, because some old Gnome libraries required by the screenshot tool have been removed from Ubuntu universe repositories. If you’re just looking for an alternative, I would recommend Flameshot which can be installed from Ubuntu Software. Type user password (no asterisk feedback due to security reason) when it prompts and hit Enter to continue. Once installed, launch it from gnome software menu and enjoy! And remove the PPA via Software & Updates -> Other Software. Can’t load ‘/usr/lib/x86_64-linux-gnu/perl5/5.28/auto/Gnome2/Canvas/Canvas.so’ for module Gnome2::Canvas: libgnomecanvas-2.so.0: cannot open shared object file: No such file or directory at /usr/lib/x86_64-linux-gnu/perl/5.28/DynaLoader.pm line 187. Compilation failed in require at /usr/lib/x86_64-linux-gnu/perl5/5.28/Gnome2.pm line 10. BEGIN failed–compilation aborted at /usr/lib/x86_64-linux-gnu/perl5/5.28/Gnome2.pm line 10. Compilation failed in require at /usr/bin/shutter line 37. BEGIN failed–compilation aborted at /usr/bin/shutter line 37.